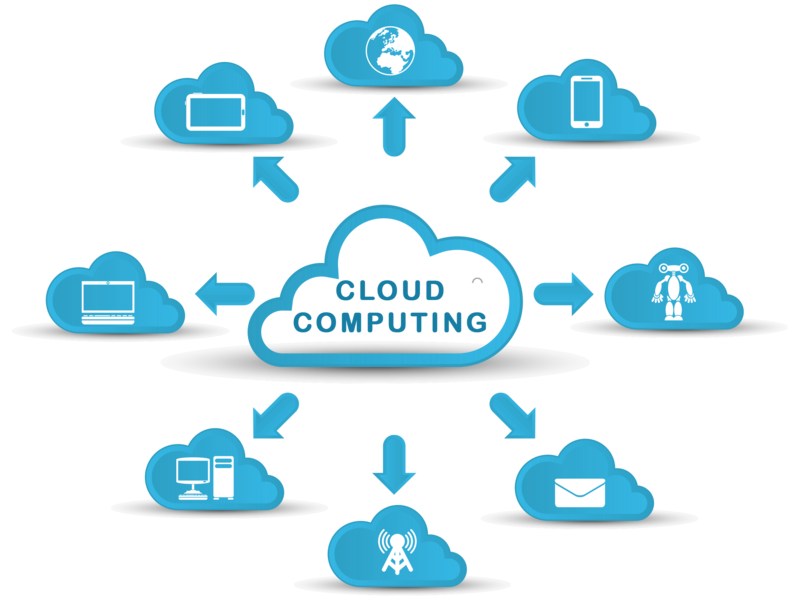 Cloud Computing is well known term now-a-days. It is a buzzword in IT Industry. We are quite familiar with this term in our day to day life still many of us are curious to know what exactly cloud computing is. Cloud is the term that refers to Internet or Network. It represents something present at remote location. Cloud Computing is delivering computing power such as CPU, RAM, Storage, Databases, Networking, Operating Systems, analytics etc. IT resources over the Internet through a cloud services platform. It allows us to create, customize and configure business applications online. It is the on-demand online delivery of various IT resources via cloud service platform like AWS (Amazon Web Services), Azure, Google cloud rather than physically having the computing resources at particular location. Companies that offer these services are called Cloud Providers. Cheap in terms of money: Here we don’t require to invest capital for buying hardware and software and setting up and running on-site datacenters such as the IT experts for managing the infrastructure, the racks of servers, the round-the-clock electricity for power and cooling. Fast Service: Generally, these are self-service and are provided on demand. On a few mouse clicks even a vast amounts of computing resources can be provisioned in minutes. It gives businesses a lot of flexibility and taking the pressure off capacity planning. Global scale: It include the ability to scale elastically. It has the ability of delivering the right amount of IT resources such as more or less computing power, storage, and bandwidth etc. exactly when it is required and from the exact geographic location. High Productivity: On-site datacenters typically require hardware set up, software patching and other time-consuming IT management chores. Cloud computing removes the need for many of these tasks that means IT teams can spend time on achieving more important business goals. Better Performance: These services run on a global network of secure datacenters and upgraded to the latest generation of fast and efficient computing hardware. This gives several advantages including reduced network latency for applications and greater economies of scale. Much Reliable: Data can be mirrored at multiple redundant sites on the cloud provider’s network. Cloud computing provides data backups, disaster recovery and business continuity easier at low cost. Public clouds are usually used for B2C (Business to Consumer) type interactions. In this type of cloud the computing resources are owned, governed and operated by third-party cloud service provider like government, an academic or business organization which deliver their servers and storage over the cloud. Microsoft Azure is a most popular example of public cloud. In public cloud, all hardware, software and other supporting IT infrastructure is owned and managed by the cloud provider. One can access these services and manage his/her account using a web browser. A private cloud may be physically located on on-site datacenter of the organization. Sometimes, companies pay third-party service providers to host their private cloud. In private cloud, computing resources are deployed for a particular organization. This cloud type is mainly used for intra-business interactions where the computing resources are owned, operated and governed by the same organization. Hybrid cloud may be used either for B2B (Business to Business) interactions or for B2C (Business to Consumer) interactions. The deployment method is called hybrid cloud because the computing resources are bound together by different clouds. 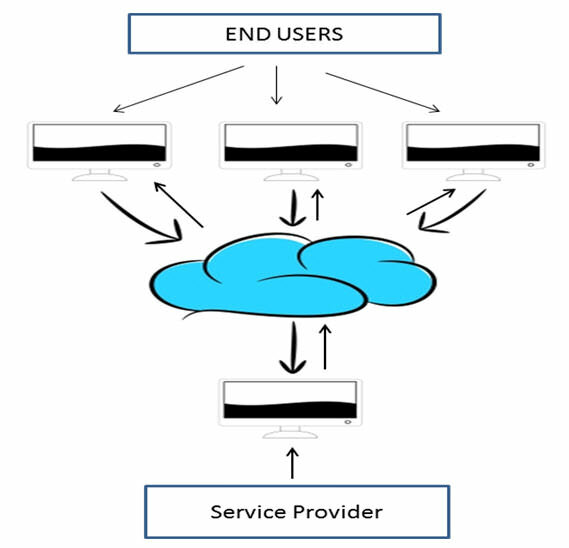 Hybrid clouds combine public and private clouds. It binds private and public cloud together by technology that allows data and applications to be shared between them. Hybrid cloud provides businesses more flexibility and more deployment options by allowing data and applications to move between private and public clouds. Cloud computing has three main types that are commonly referred to as: Infrastructure as a Service (IaaS), Platform as a Service (PaaS), and Software as a Service (SaaS). Selection of correct type for your requirements can help you to manage the accurate balance of control and avoid undifferentiated heavy lifting. 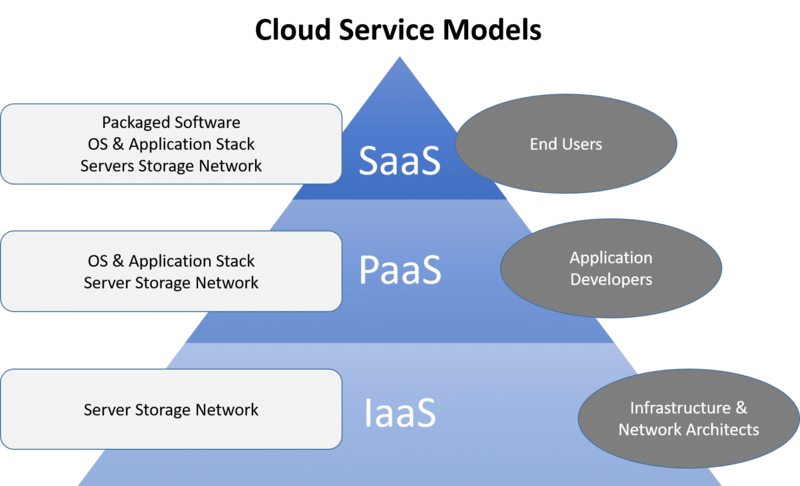 Saas is a software distribution model. In this model, applications are hosted by a vendor or service provider and made available to customers over the internet. SaaS is becoming an increasingly prevalent delivery model as underlying technologies that supports Service Oriented Architecture (SOA) or Web Services. With the help of internet, this service is available to users anywhere in the world. Anyone who requires an access to a particular software can be a user, whether it is one or two people or every thousands of employees in a corporation. SaaS is compatible with all internet enabled devices. Software-as-a-service (SaaS) is a method for delivering software applications over the Internet, on demand. It is typically done on a subscription basis. Paas provides a platform and environment to allow developers to build applications and services. This service is hosted in the cloud and accessed by the users via internet. PaaS services are constantly updated & new features added. It provides a platform to support application development. It includes software support and management services, storage, networking, deploying, testing, collaborating, hosting and maintaining applications. Iaas provides access to computing resources in a virtualized environment on internet. It provides computing infrastructure like virtual server space, network connections, bandwidth, load balancers and IP addresses. The pool of hardware resource is extracted from multiple servers and networks usually distributed across numerous data centers. This provides redundancy and reliability to IaaS. Infrastructure-as-a-Service (Iaas) is the most basic category of cloud computing services. It allows us to rent IT infrastructure like servers and virtual machines (VMs), storage, networks, operating systems etc. from a cloud provider on a pay-as-you-go basis. Depends on the Internet completely: As we have already discussed every computing resource is accessible over the internet only. In case, if the cloud server faces some issues, your application will suffer the same. If there will be some issue with your internet service such as a lot of fluctuation, the cloud computing will not work well then. Data incompatibility: This varies as per service providers. Sometimes, a vendor lock the customer by using proprietary rights so that a customer cannot switch to another vendor. So ensure your contract with the provider according to your terms instead of them. Security breach threats: Here, all the data transactions are done via internet. Every cloud service provider claims to be one of the best-secured-service providers but it should be your call finally. Cloud computing history has noted big accidents before. So, if you own a business where not even a single miss or corruption of data is acceptable at all, you should think 1000 times before moving towards the cloud. Miscellaneous costs: The common mistake business owners do is to invite unwanted expense in order to be highly-advanced. If your current infrastructure is serving the needs, then migrating to the clouds is not recommended. To be compatible with clouds, your business applications may need to be re-written. Moreover, if your business demands huge data transfers, every month you would be billed huge as well. Sometimes, having set up own infrastructure can save you from this kind of constant high billings. Customer Assistance: Before choosing clouds, check out the query resolving time. You must check for the best service provider with time. If your business faces heavy traffic every day and heavier on weekends, a quick resolution is always top priority. The best cloud service provider must have optimum support for technical difficulties via email, call, chat or even forums. Select the provider who provides the highest support at feasible time. We must say that cloud computing is an up gradation of technologies. Small or large all the businesses are moving towards it. But it is really worth to think for a while to determine whether this is best fit for your business this time before joining the race of migration towards the cloud. When you will get a deep understanding of cloud computing that will be the perfect time to take a giant leap. Was this article helpful? We would love to hear from you. Feel free to share your views in the comment section below. Hats off to you. You have explained each and every thing very easily. Now I have clear idea about cloud computing. I have bookmarked you for future posts. I like the post. I enjoyed every moment while reading it. You have a very good article i have ever read. Thanks for posting! I like reading your posts, you are an amazing author.Your blog is already bookmarked. Keep posting great blogs. Highly energetic blog, I liked that bit. I am waiting for part 2.